On Tuesday 19 April we will be holding our annual meeting at 7:30pm onwards upstairs at the Priory Arms, Landowne Way, SW8. At this meeting we will be reviewing the successful year and electing a new management committee for 2011/2012. This is your chance to find out more and perhaps get involved in Lambeth Cyclists – we are looking for new committee members so how about putting yourself forward? The next course will start at 6:45pm on Tuesday 3 May and costs £55 for the five weeks. Following protests from Lambeth Cyclists and others from across Lambeth and London Lambeth Council has removed the signs that apparently banned cycling on the Southbank of the Thames between Albert Embankment and Gabriels Wharf. The new signs, as pictured state “Pedestrian Priority Considerate Cycling Welcomed” – what we suggested as appropriate all along. 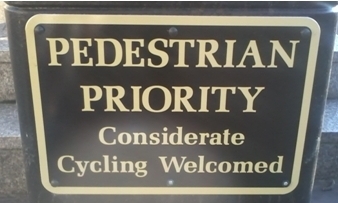 As outlined previously on this website the signs were put up as a result of pressure from local businesses and some residents over what they saw as inconsiderate cycling. 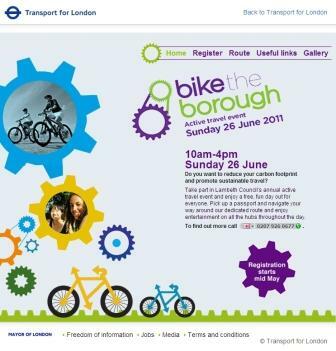 It soon became clear that when the consequences were explained most users of the Southbank path were not in favour of banning cycling and the ban contradicted the borough’s and the Mayor of London’s stated aim of increasing the number of people cycling in London. Added to this was the need, if the signs were to become permanent, to obtain a traffic regulation order which would have required extensive consultation. Thank you to everyone who wrote to their Councillors and MPs on this issue – these showed the depth of feeling on this issue which enabled us to work the Council to find ways of working around this issue. We will keep this issue under review and will seek to prevent any future ban being implemented. We hope to investigate further with Lambeth the possibility of making the parallel road route more cycle friendly so that cyclists have two options. According to a Freedom of Information request the original signs cost £2,600 to manufacture and install – an entirely unnecessary cost. Not Lambeth as such but we think of interest to Lambeth Cyclists who regularly cycle over Blackfriars Bridge - Transport for London are consulting on proposals for changes to the crossings and other arrangements at the Northern side of Blackfriars Bridge. The reopening of Blackfriars station will require changes to the local area which will impact on cycling. Through Lambeth and Southwark London Assembly Member Valerie Shawcross we have expressed our concerns about the cycle-friendliness of the area and now TfL have come forward with proposals including more advanced stop lines and a (legal) way for cyclists to turn right onto the Bridge from Victoria Street. They are consulting on the proposals so if you use the bridge see the Blackfriars Bridge section of the Tfl website to access the TfL consultation which closes on 15 April.